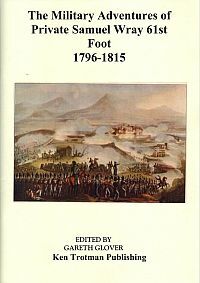 I recently discovered a very poor copy of this extremely rare booklet, published at Bedford in 1823 and felt that it was a perfect subject for a booklet in my series of very rare or previously unpublished memoirs from the Napoleonic wars. It is one of those rarity of rarities, the memoirs of a member of the ranks at a time when literacy levels were low, and it would appear that it may have been written down by another to be published locally. Samuel Wray volunteered to join the army in 1796, originally with the 68th (Durham), but quickly moved to the 61st (South Gloucester) Regiment. With this regiment Wray saw service in the Cape Colony, before moving to Egypt where he took part in that remarkable march across the desert to Cairo. Afterwards his regiment served at Malta, Sicily (where he took part in the Maida campaign) and Gibraltar, before finally joining Wellingtons army in Spain. The 61st were one of the unsung heroes of the Peninsular campaign, serving there from the Battle of Talavera throughout until the Battle of Toulouse. The regiment was particularly distinguished at the Battle of Salamanca where they helped seal the victory by destroying Clausels counter attack but at a heavy cost and Wray was one of the wounded here. When the fighting finished in 1814 Wray took his pension and retired from army life having not seen the coast of mainland Britain for seventeen and a half years! He therefore missed the ensuing Waterloo campaign. There is to my knowledge only one other memoir from this regiment and that of doubtful validity in some instances1, that of The Soldier Who Walked Away: Autobiography of Andrew Pearson, a Peninsular War Veteran, making this publication doubly important. Wray was clearly a simple honest soldier, who does not appear to have gained any step in rank during his career and is guilty at times of confusing his story and quoting hearsay as facts. However, having checked out his story in great detail, it would appear overall to be a genuine and honest record to the best of his abilities by a simple soldier who did not keep a diary and therefore relied on his memory. 1 For example, Pearson claims to have been at Seringapatam in 1799 and the Battle of Albuera, but the 61st were not at either.